Dollar Run Likely Over… Look Out Below! 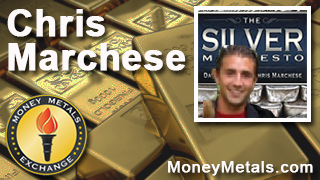 Coming up in just a bit we’ll talk to Chris Marchese, co-author of The Silver Manifesto, a brand new book that has already become the preeminent source for all things silver. Chris discusses the global demand for the white metal, its role as a monetary asset, and why silver is poised to make big moves in the years ahead. Be sure to stick around for my interview with Chris Marchese coming up in just a moment. Well, we’ve seen some significant moves in gold and silver prices over the past few days. On Thursday, gold closed back above $1,200 per ounce for the first time in four weeks. Gold’s strength comes as the U.S. dollar retreats and stock market volatility and geopolitical risk drive safe haven demand. The U.S. Dollar Index poked above the 100 level early last week ahead of the Federal Reserve’s policy statement but has since lost ground. So far the dollar hasn’t broken down below the up-trending channel it’s been in since last July. But HSBC analysts say the U.S. currency is overvalued and due for a trend change. They believe that even if the Fed raises rates later this year, the widely anticipated move won’t boost the dollar more than the currency markets already have in advance. A downward trending dollar would tend to stimulate upward trending precious metals prices. For the short-term, traders who are hoping to see gold put in a solid weekly close above the $1,200 level may have be sweating that one out all day. As of this Friday recording, gold has given back some of the gains seen earlier in the week and has dipped below that key psychological level for the moment and now trades at $1,199 an ounce, still good for a 1.3% weekly advance. Overall though silver is definitely confirming gold’s strength. After surging 7% last week, silver spot prices are up by just about 1% now for the week and currently come in at $16.99 an ounce. Platinum is off 1% so far today and is now flat on the week at $1,140 an ounce, while palladium looks lower for the third straight week. Palladium prices are off another 3.3% this week, much of that coming with a selloff today, and currently come in at $753. In economic news, the Labor Department on Tuesday released the latest Consumer Price Index reading. The CPI rose by 0.2% for the month of February, after showing a 0.1% decline for January. Relatively strong housing numbers, a weaker dollar, and rebounding commodity prices could pressure the CPI upward in the months ahead. Prices for some CPI components are highly cyclical and prone to volatile swings from month to month. But the trend for medical costs and government spending is up, up, and up. Consumers and taxpayers just won’t a get a break from these costs like they have recently at the pump for gasoline. The budget deals crafted in Congress this week show just how fleeting spending restraint is. On Wednesday, the House of Representatives passed a budget resolution that backers proclaimed would balance the federal budget over 10 years. But then just one day later House Speaker John Boehner and Democrat leader Nancy Pelosi agreed on a plan to spend an additional $141 billion on Medicare doctor reimbursement. The Heritage Foundation says the bipartisan spending scheme will add $500 billion to the national debt over the next 20 years. So much for balanced budgets!! Most of the talk that comes out of Washington regarding deficits and debt is either misinformed or deliberately misleading. The official debt of the United States is based on fuzzy accounting that no private corporation would be able to get away with. Economist Laurence Kotlikoff calculates a fiscal gap of not $13 or $18 trillion, but $210 trillion!! Laurence Kotlikoff: Yeah, if you take all the expenditures that the federal government is projected to make, as projected by the Congressional Budgeting Office, back in July… take all the spending on defense, on repairing the roads, on paying for the Supreme Court justices salaries, Social Security, Medicare, Medicaid, welfare, everything, take all those expenditures, project them into the future, form their present value, the value in the present. Compare that with the present value for all the taxes projected to come in. The difference is $210 trillion. That's the fiscal gap. That's our true debt. There's no risk weight associated with the US Treasury Bonds. They're viewed as perfectly safe. Well, I think they're one of the riskiest securities in the world, because I think interest rates are likely to go up, because I think the Fed's going to have to keep printing money, because Congress isn't paying our bills, and that's going to lead to inflation, eventually. I think long term treasuries are extremely risky, and they can certainly drop 5%, 10%, 20% overnight, and put my bank, that was viewed as perfectly safe today, out of business. The risks of a future outbreak of inflation, or a banking crisis, or both are risks that everyone should be preparing for NOW. The risks will only grow over time as the nation’s fiscal gap grows. And while we can’t predict when or how the next financial crisis will manifest, the potential exists that it will be bigger than the 2008 financial crisis. Then, the Fed stepped in to bail out the banks. But what will happen when the Fed has to bail out the government? We can only guess as to how low the value of the dollar might go. What is certain is that holders of precious metals in physical form will not see their wealth evaporate. Yes, there has been and will be price volatility in the metals. That means there are better times than others to be a buyer. But rather than try to pick an exact bottom, which nobody can do successfully unless they happen to get lucky, you can simply decide to be in accumulation mode when prices are deeply discounted from former highs. That’s not the case with a lot of financial assets these days, but it’s certainly the case with gold and silver. Well now for more on those key drivers for a lower dollar and higher precious metals prices, let’s get right to this week’s exclusive interview. Mike Gleason: It is my privilege now to be joined by Chris Marchese, mining analyst and contributor to The Morgan Report. We’re having Chris on with us today because he and our good friend David Morgan have just released a fantastic book called The Silver Manifesto. It’s basically the bible on silver and silver investing. Chris, thanks for joining us today. It’s nice to finally get a chance to talk with you. Chris Marchese: You too. It’s my pleasure. Mike Gleason: First off, I want to say that I was blown away by the book when I first got my hands on it a few weeks ago. It’s beautiful and unbelievably thorough, starting with the origination of silver as a currency and as a means of exchange thousands of years ago, following it all the way through history, examining its use as both money and many applications that utilize it in industry. It dissects the mining aspects of silver, the overall supply-demand dynamics, the price history, and a pricing forecast going forward, and many other components as well. It’s incredibly comprehensive. Now, I know the creation of this book was years in the making, so talk about how that all came about, all the research that was involved, and ultimately, what you and David were looking to do together by writing The Silver Manifesto. Chris Marchese: About 16 months ago, we started throwing around the idea just because we felt that the American people and humanity in fact need to know the truth about what’s really going on with the … How these government shenanigans, particularly in the Western world. The truth about the monetary system is essential to all human beings. Money transcends everything, and everyone is interested in money. The truth is never really discussed in the mainstream, and it’s kept mysterious. Only the rich and powerful have knowledge about it. And we try to bring a comprehensive look into the silver market, and aren’t just that, but just the intricacies of money and banking, and what we call “The Debt Bomb”. It’s just astounding how much debt has been accumulated both public and private throughout all the major economies in the world. And every time in history, it’s been basically the crux of all currency prices, just having overwhelming debt burdens. Mike Gleason: Silver is a metal like no other given its countless industrial applications coupled with its use as money throughout history. Now first, diving in to the financial and monetary component of silver, the 2008 financial collapse and the central planners’ response to it has really underscored the importance of having both gold and silver, owning the money metals as insurance against the collapse in the paper currency Ponzi scheme that’s just grown and grown in recent years. Talk about that aspect a little bit more and why you view silver as such as an incredibly important asset for the average American to own. Chris Marchese: Well because most people in the US especially are just complacent about everything instead of trying to question everything. I think that stems from (the fact that) we’ve had it so good for so many years. We’ve been the world economic superpower, we’re starting to lose it, and we’ve beem the reserve currency. We’ve been able to abuse that to our benefit in the detriment of a lot of other countries. In 2008, everything came to a head. If you had paid attention to what the economic policies of Alan Greenspan, you saw that he just avoided a real cleansing of the imbalances of the economic system in 2000, 2001 by slashing rates down to 1% and keeping them (there) for a long period of time. The amount of credit expansion and lending standards were just atrocious. It was only a matter of time before that was going to come to a head; but more importantly over that time, someone should ask themselves as why was there so much gross federal debt accumulated under what was supposedly a new era of economic prosperity. There’s so many side things that I think would prove to be just more nails in the coffin of the US dollar whether it’s through a monetary reset or hyperinflation. Although, I think the former is a lot more likely. The derivatives bomb, the top 5 US banks, they hold something like $293 trillion of derivatives, so imagine just 1% of those go bad. Everything is fragile and real money, the market has always chosen silver and gold going back as we referenced, since, the earliest we could find, 3200 B.C., the advent of handwriting that was used in journal entries. If nothing else, it should be owned by all Americans just as insurance policy against the government malfeasance. At this point in time, things have gotten so bad. I don’t think the typical 10% recommendation by most lending managers and whatnot is really enough anymore. It will probably be enough to preserve your capital, but this is also presenting a great opportunity for capital accumulation. Paper money always fails. It always has. It always will for the same reasons: the inherent nature of government is to use as much power as possible. Mike Gleason: Given the financial turmoil and massive efforts globally to inflate the monetary supply as you just alluded to, we’re starting to see a bit of a movement developing towards a return to a metal-backed currency. Now, in the second chapter of your book, you discussed the bimetallic standard that we’ve seen used in past history, but you discussed the importance of implementing such a system in the correct way, meaning, the advantages of not fixing the price of silver against gold. Speak to that if you would in both the idea of a bimetallic system and how when used correctly, it can really provide financial discipline for the politicians, something we’re desperately needing these days. Chris Marchese: Yeah. A bimetallic standard has always been chosen by the market, but there’s always been a lot of government interference one way or another. Even in the US when we were founded on a silver standard, which most don’t realize, but the problem was as in all other times in the past was they would define silver, for example, as 371.25 grains of silver for each dollar, and then they would fix the gold rate, the gold price to the silver price. So they would maintain a ratio. Markets aren’t static. They’re incredibly dynamic, so that ratio is ever changing. And when you get prolonged periods of time with big movement in one or the other, say the gold rush in California. Keeping a fixed ration brings Gresham’s law in to effect. That is bad money drives out good. Basically, that same undervalued money gets exported. People want to hoard it because they see it’s undervalued for what they can buy it at. Instead, the overvalued money continues in circulation. It makes sense if you just think about it, under a bimetallic system gold is used for international dealings, international trade; and silver is used in everyday commerce. Then in addition to that, there are some tighter checks and balances relative to monometallic standard. For example, if governments colluded, and they inflated their respective money supplies equally. Mike Gleason: When it comes to the industrial demand for silver, your 5-year forecast is maybe not as optimistic as some; but even with the decline in the global economy that you’re expecting, you still see a healthy increase in silver consumption. Talk about that. Chris Marchese: Well because most things that contain silver, there’s such little silver in it because a little silver goes a long way just because of its superior thermal and electric conductivity characteristics. It’s very price inelastic, so the price of silver could go through the roof, and it would have very little effect on whether a substitute would be sought out for a particular product. Because it is the best conductor of heat and electricity, it makes it so vital, especially this day and age, we’re living in a technology era. There are so many novel uses that could consume very material amounts of silver in the future. One is solar use. It used to be uneconomical, and now it’s closer to being economical. The oil price is going to go back up. This is going to be a short-lived, maybe one to two-year depression in oil prices. Once that happens, alternative energy sources will be sought after again. These low energy prices aren’t here to stay. If you look at a lot of those that were able to increase their production significantly due to fracking, most of them have breakeven costs of about $75, $80 oil, and so at these prices, I think oil is around $45 to $50, it’s going to be really tough on them. Especially considering the fact that the industry as a whole has a lot of debt out there. Say oil were to remain just around $60 through 2016, I would guess there would be an unthinkable amount of bankruptcies. Companies are going to start closing, shutting down operations, and do what they need to do to remain solvent. Mike Gleason: You’re expecting some big things for silver over the next few years given all the previously mentioned issues out there, and I’m reading here that you think triple-digit silver isn’t out of the question as soon as later this decade even. What’s you’re thinking there, and how did you come up with that forecast? Chris Marchese: David in his first book said that, and there’s really no reason to deviate from that. And I agree with it, and I think it could very well go to $500 or $600, but that has to be taken with a grain of salt because it’s not that silver will necessarily appreciate a whole lot, it’s that the dollar would depreciate. There’s are a lot of countries that are trading with other currencies that aren’t the US dollar, so they’re circumventing the US dollar. With the Asian Infrastructure Bank and the rise of China to a more prominent role, I think the US dollar will be dropped officially at some point as the reserve currency. And when that happens, there’s so many potential outcomes. I don’t want to say one exactly, but they all lead to a much, much weaker dollar. We do see the Dollar Index at highs not seen for 7, 8 years, but you have to remember, all that is, is it’s measured primarily against three other currencies. Over 50% is again for Euro, then you got the yen and the pound. I think those account for about 80% of the Index. It’s not saying much when you’re measuring one garbage currency to currencies that are worst. Yes, a $100 silver, I would really have to think about that one in terms of what a good metric is to come up with. It would have another scarce commodity. Say barrels of oil, or the gold to silver ratio, or something along those lines. Mike Gleason: Yeah. Certainly, the dollar, I like to say, is seemingly the tallest midget at the circus right now when you measure it against its unbacked brethren around the world. There’s certainly going to be lots of issues coming with the dollar once the globe starts to shift its focus on our issues here instead of concentrating on what’s happening in Europe and elsewhere. Chris, it’s a fascinating read. You and David truly did a terrific job with this book, and I enjoyed having you on. Thanks very much for spending some time with us and sharing your insights from The Silver Manifesto, and good luck with the book. Chris Marchese: Thank you very much, and it was my pleasure. 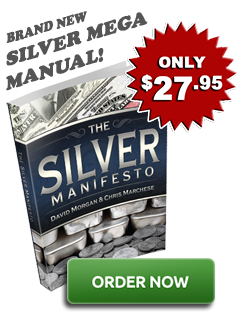 Mike Gleason: I strongly urge everyone to pick up a copy of The Silver Manifesto. If you’ve ever bought silver, thought about investing in bullion and mining stocks, ETFs, anything whatsoever, the information on this book is second to none when it comes to the silver market. You can now buy it at Moneymetals.com for $27.95. It’s easy to find it on our site. It’s actually linked from every page on the Moneymetals.com website. You definitely won’t be disappointed. Well that would do it for this week. Thanks again to Chris Marchese, co-author of The Silver Manifesto. Check back next Friday for the next weekly Market Wrap Podcast, and to tease you a little bit here, I will say that you don’t want to miss our guest next week. It will be a must-hear interview, I can assure you. Until then, this has been Mike Gleason with Money Metals Exchange. Thanks for listening and have a great weekend, everybody.